The present study seeks to lay the foundations for a firmly-grounded understanding of Written Corrective Feedback (WCF) as a Formative Assessment (FA) tool through student writing.  More specifically yet, it is concerned with examining the intricate correlation between Moroccan English Language Teachers’ (ELT) attitudes and practices with respect to the way they understand and apply FA by means of WCF on students’ written productions. 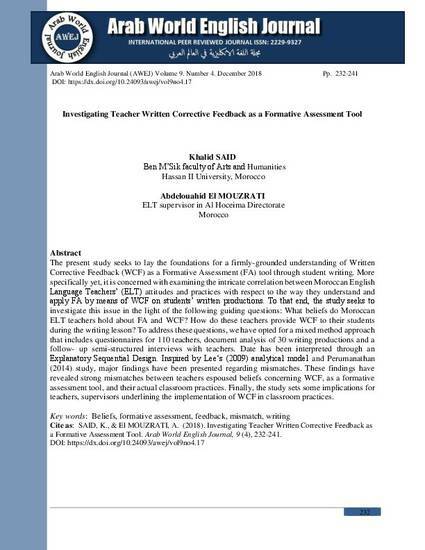 To that end, the study seeks to investigate this issue in the light of the following guiding questions: What beliefs do Moroccan ELT teachers hold about FA and WCF? How do these teachers provide WCF to their students during the writing lesson? To address these questions, we have opted for a mixed method approach that includes questionnaires for 110 teachers, document analysis of 30 writing productions and a follow- up semi-structured interviews with teachers. Date has been interpreted through an Explanatory Sequential Design. Inspired by Lee‘s (2009) analytical model and Perumanathan (2014) study, major findings have been presented regarding mismatches. These findings have revealed strong mismatches between teachers espoused beliefs concerning WCF, as a formative assessment tool, and their actual classroom practices. Finally, the study sets some implications for teachers, supervisors underlining the implementation of WCF in classroom practices.